Increase the notoriety of your company internationally with my help! Ethno Travels is the reference blog for travellers seeking local experience, especially in the Basque Country and tribal India. Its agenda of traditional Basque festivals inspires several thousand visitors every month to discover the Basque Country through its dances, culinary specialities, sports, festivals… It allows them to organize their trip, helps them choose their accommodation, restaurant, discover the best local producers thanks to its impartial and recognized advice. Every year, its articles on Asian culture encourage travellers from all over the world to discover the lesser-known peoples and festivals. Why should you work with Ethno Travels? 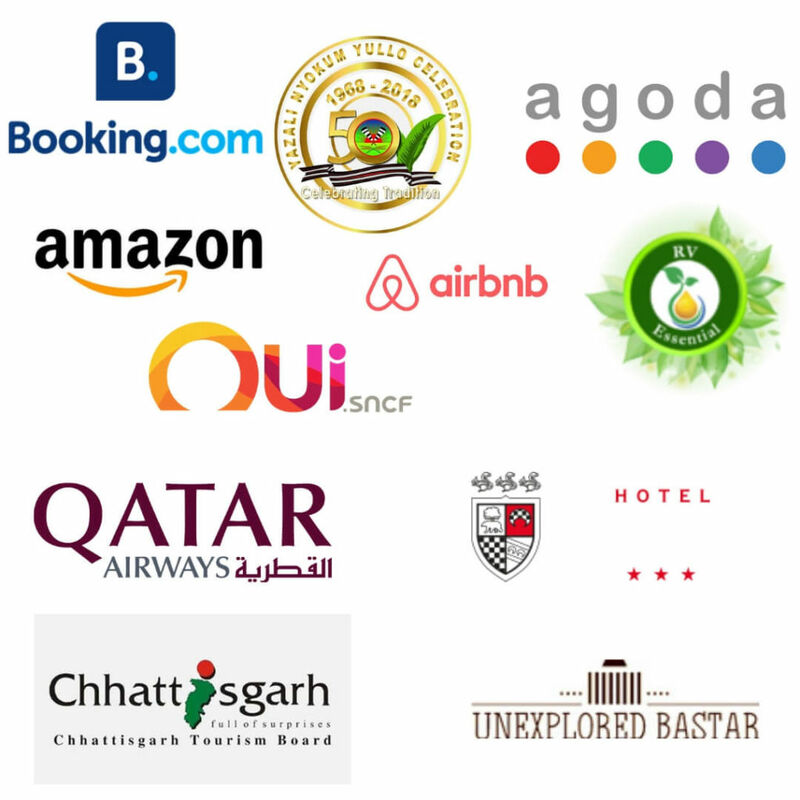 Between the site and dedicated social networks, Ethno Travels makes it possible to be known to tens of thousands of travellers based mainly in France, USA and India. In addition to the site and its agenda, travellers can find me on Facebook, Pinterest, Instagram, YouTube and Twitter. Thanks to the optimization of all articles for search engines, the use of the latest promotion techniques on social networks and bilingual French-English content, Ethno Travels makes it possible to reach travellers far beyond the Basque Country and France. Travel blogger since 2003, hospitality professional trained by the Accor group since 1997, I created Ethno Travels in June 2017 to provide a professional response both to travellers and to companies in the tourism sector. All articles are written following a precise editorial line adapted to the professional world, and campaigns on social networks are studied to multiply the impact of blog articles, both in the short and long term. 65% of leisure travellers are inspired by online sources and book their trips after consulting one or more travel blogs (Travel Trends Report 2019, Trekk Soft). 2019 confirms the search for a unique, local experience, cultural and historical discovery, in line with the blog’s content. With the help of the website and my online presence, I can help you to increase your visibility and find new customers. A solo traveller since 2001, a blogger since 2003, passionate about indigenous peoples and cultures, I began to take an interest in the most traditional Basque festivals in 2002 and have since then continued to list them. At the end of 2018, I created an online calendar to help travellers discover them and plan their trip accordingly. Very quickly, the calendar became the most visited part of my site, generating regular interactions with travellers and local professionals. My profile as a solo traveller combined with my expertise in hospitality allows me to differentiate myself from other blogs and to better understand the expectations of travellers, as well as the needs of professionals. The calendar has become the cornerstone of the blog, allowing me to highlight the local businesses that are best suited to my audience. At the same time, I continue to discover new places and cultures, which I in turn introduce to other travellers on the blog. My complete professional background on LinkedIn. Sponsored article written by me, published on my blog, in French and English. Product or service review, published on my blog, in French and English. Hotel / restaurant / airline review. Recommendation of your hotel, restaurant or local business in the festival agenda (companies based in the Basque Country and around only). Content creation: articles for your blog, translations. Coverage of a festival, activity, destination. 1. Sponsored article written by me, published on my blog, in French and English. I can promote your company related to travel or Basque culture. I can write an article, optimized for search engines, about your brand or destination by mentioning your brand. I can promote this article on social networks, including using Pinterest pins. Increased awareness and exposure of your brand to an international clientele looking for local information. Better ranking in search engines through the link to your site. 2. Product or service review, published on my blog, in French and English. I can promote your product or service, whether it is a physical or online product. I will write a full review and promote the article on social networks. You can see an example here. Improved visibility and awareness of the product or service. Perpetual marketing – reviews are published for an unlimited period of time. They will continue to strengthen your marketing for years to come. 3. Hotel, restaurant, airline reviews. If you would like to benefit from my expertise in the field of hospitality, I can provide you, in addition to the advice written on the site, with my recommendations to improve your customer service. Trained in hospitality, staff training and crisis management by the famous Accor hotel group, I have been a manager and sales trainer from 1997 to 2017. I will publish a full review on the blog and give you a report with the 10 most important recommendations to improve your service and/or your communication. In addition to the benefits mentioned above, you will benefit from the external advice of a hospitality and communication expert. 4. Recommendation of your hotel, restaurant or local business in the festival agenda (companies based in the Basque Country and around only). Your local hotel, restaurant or business will be mentioned in the travel preparation section of the description of local events, provided it meets my quality standards. You directly reach travellers going to festivals in your area. You benefit from a higher exposure than through a classic article. Your establishment is recommended as the best option in its category. 5. Content creation: articles for your blog, translations. You have a website to promote your business but you don’t have time to write quality content? I can write and publish articles on your blog for you? You want to attract an international clientele thanks to your website? I can translate it for you (English-French)! A site with regularly published content = a better-ranked site. A site with more content = more keywords and therefore more opportunities for visits and bookings. You no longer need to worry about keeping your site up to date. You attract more international customers. 6. Coverage of a festival, an activity, a destination. Whether you are based in the Basque Country or elsewhere, I can help you promote a festival, your activity or your destination. For festivals in the Basque Country, feel free to contact me to know if I already have videos and photos to make a teaser! By sharing my personal experience with me, you increase your online visibility and awareness of your brand, festival or destination in a way that connects with people. The campaign can include publications on other online, national and international media. Thanks to the use of the latest SEO methods, the campaign reaches a targeted and interested audience. Perpetual marketing – reviews and videos are published for an unlimited period. They will continue to strengthen your marketing for years to come. If you are a brand I love and trust, I can promote it regularly on the site and social networks. Improved exposure and brand awareness. Brand association: my readers will associate you with my brand, a sign of trust for them. Perpetual marketing – reviews and videos are published for an unlimited period of time. They will continue to strengthen your marketing for years to come. You need a travel blogger who is an expert in hospitality or specialized in indigenous cultures to speak at your event? Using one’s popularity to advocate for tribes in India. Working with travel bloggers to improve brand awareness. Adopting an attitude that encourages meeting good people while travelling. Some brands I’ve worked with. What a perfect analysis of how one can be perceived by a group and how to leverage that trust to share their stories and positively influence a whole world of travelers. I particularly love that you’re able to share stories and broaden the views of children. It’s amazing when one can be respected and at the same time publicly promote a culture, both for awareness and to increase tourism in a dignified manner. One more reason we love following your travels and work. Rob Taylor – reader of the blog and blogger for 2 Travel Dads. No hard work is ever wasted, Stephanie. I love your passion and the good work you do in my country, while many people still think that India is underdeveloped and not worth the time. Thank you for your time and effort! Priyadarshini Rajendran – reader of the blog. One life will be enough to taste all these wooden peaks! Sharing and pleasure of the senses… What happiness this Basque Country… Thank you again for your articles Stéphanie… Ah you love your Basque identity… San Sebastian will be one of my next destination before it is invaded from all over the world… and elsewhere… if it is indeed the best culinary experience in the world according to Lonely Planet. Now the Basque Country is pointed, stuck ! On the world map as an essential culinary destination. Charles Ichkanian – reader of the blog. You can contact me either directly on my mobile phone on 00336 26 03 43 11, or by using the form at the bottom of the page. We can discuss the options most suitable for your needs. I’m waiting for your news!